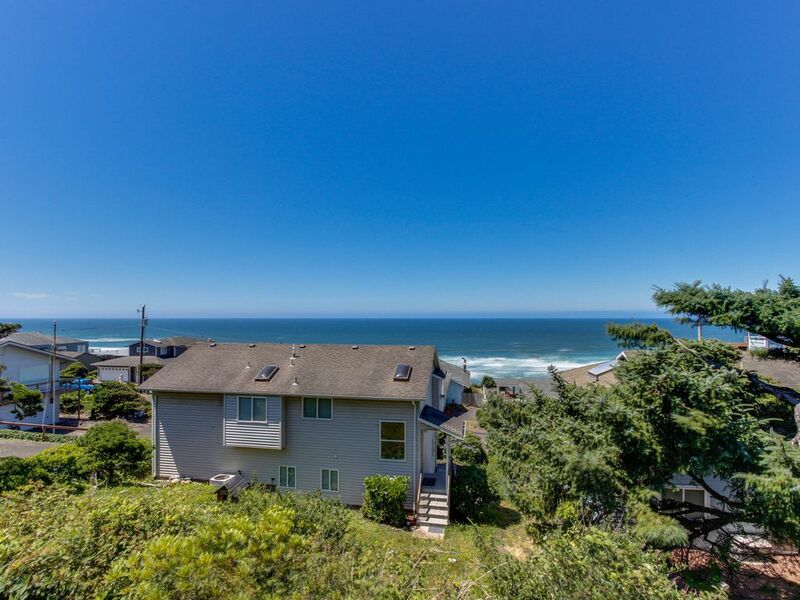 This summer fun getaway vacation rental in Lincoln City has four bedrooms, three and a half baths, a game room complete with a foosball table, and endless ocean views. What more could you need for an unforgettable family retreat? Located in a quiet residential neighborhood, this home is three blocks away from the beach at Road's End State Park. Downtown is about a five-minute drive south, where you can hang out at GameOver Family Arcade or grab a bite at The Blackfish Cafe. This house has a full kitchen, four bedrooms with accommodations for up to 14 guests, three and a half bathrooms with one featuring a jetted tub, and outside decks. There's also a living room on the main level so when you and your guests aren't enjoying the game room, you'll have plenty of space to socialize. Whether you are looking for a place to gather your family near and far or just planning a fun weekend with friends, this house is big enough to accommodate everyone yet small enough to feel like home. Everyone will have a comfortable place to sleep here. There's a two-car garage and two more parking spots outside, so you may bring as many as four vehicles here. As the travel season approaches, don't miss out on booking the perfect Lincoln City vacation home waiting for adventurous travelers. Important: There is a strictly enforced allowance of 4 cars (2 must be kept in the garage). Additional vehicles may result in fines or towing for the guests. Water Access: The beach access is 3 blocks to the North at Road's End State Park. I love the house. We were down for the westernbca pool tournament. The only thing that could have made it better would be a diamond pool table right in the house. Will be renting again when going down for the tournament. This home was perfect for our family, it had everything we could possibly need and want. Enjoyed the most incredible sunsets each night from the balcony. We will definitely book again. Thank you so much for everything! Treated my mother for her 65th birthday, she loved it. Very quiet location. Spacious accommodations were ideal for our large family, complete with outstanding kitchen and two living rooms! Easy access to the beach and a quiet setting were exceptionally fine. Our group has stayed here twice. It's perfect for our needs.